Recently I worked with a couple who asked my advice on a topic I don’t often discuss. They had fallen in love not just once but twice and needed my help. They were remodeling their home exterior and had been doing their homework on which products and colors they wanted to use. 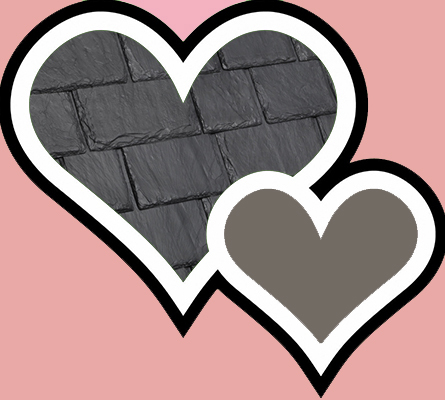 By the time this couple contacted me they had already fallen in love with a DaVinci Slate roof in Smokey Gray. It is a great choice for their home. They had also fallen in love with the idea of painting the siding of their home brown. They had seen other homes in their New England town that were brown and liked the look. They had looked at many dark browns but it was Benjamin Moore Falcon Brown 1238 that they loved. What this couple saw once they painted a section of their home and placed the roofing tile samples next to the dark brown was that the two didn’t work well together. The two were both dark and although different in color similar in value (darkness or lightness) and they started to have their doubts that the two colors they fell in love with were going to work well together on their home. That is when they contacted me to give them my thoughts. Both colors they selected were lovely on their own but were not the best choices together. Their home was large and you could see a good amount of the roof. There home was also shaded by many trees. Even with contrasting trim and a welcoming color on the front door the overall look would still be too dark and could seem a bit ominous. At the same time I understood that they had a vision of their home in brown and gray that they weren’t ready to give up on. Following my “top down” method for selecting home exterior colors it didn’t take long before these homeowners and I came up with an alternative we all were happy with. We started with the Smokey Gray roof and then looked for a brown that was a little lighter and slightly more gray. After sampling a couple of colors it was Benjamin Moore Bear Creek 1470 that captured the hearts of my homeowners. It isn’t a huge change but the color was just different enough to change the exterior dynamic and created exactly the look these homeowners first had in mind. You might think the reason people make mistakes with choosing color is that they aren’t good at picking colors but believe it or not that isn’t always the reason. Often is is because they get an idea in their mind and don’t know how to create the look unless they use the same exact colors they’ve seen. Or they might find more than one color that they just love and are blinded to the fact that they don’t work well together. Over the years, I help many homeowners who are purchasing a gorgeous polymer slate or shake roof from DaVinci Roofscapes to choose the right color for their roof as well as the other elements of their exterior. From the choice of 50 color and a whole range of blends it is easy for homeowners to fall in love with one that they really want to use. The next step is to make sure that all of the elements that will be used on the exterior work together. Since a DaVinci roof last a very long time and plays a major role in creating curb appeal, I always say to start from the top down. The roof can be 30 percent or more of what you see as you approach a home. Blending the color of your roofing material with other elements of the home exterior will create an overall cohesive look. When the roof and the main are working together it allows you to have many choices for your trim and accent colors. This also makes it easier to change the color of your front door or shutters and give you home a new look in a few years down the road.